Selahattin Demirtaş and Figen Yüksekdağ, the two leaders of HDP, remain in jail on a variety of charges. The European United Left–Nordic Green Left (GUE/NGL) Group in the European Parliament has expressed solidarity with Turkey’s main opposition left-wing party, the HDP. The group’s MEPs attended the HDP’s third annual congress in Ankara on February 11 despite heavy security. In reference to Turkish President Recep Tayyip Erdogan, Zimmer said: “No single person has the right to determine how one coexists in Turkey”. Also attending the congress was MEP Martina Michels, who is a member of the European Parliament’s delegation to Turkey. “At the HDP congress, one gets a sense that the party members and their new co-chairs will do their best to ensure the political opposition is heard and seen as an alternative,” she said. According to Zimmer, many citizens with divergent views need a voice. “This equally applies to the former co-chairs, Selahattin Demirtaş and Figen Yüksekdağ. We demand their immediate release from Turkish jails,” he said. 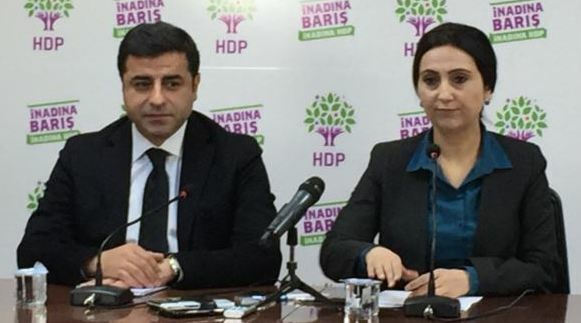 Demirtaş and Yüksekdağ remain in jail on a variety of charges.